Someone I know was whingeing about how impossible it was to lose 3-4kg, and that although she's quite small, she was sick of being flabby. I hardly eat anything, she moaned to me. So I offered to take a look at what she was eating and make some suggestions. 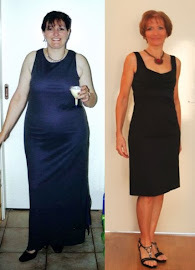 She kept a food diary for a week, I spent some time going over it and wasn't surprised to see that her meals consisted mainly of bread, buns and cakes, some rice and fruit, a tiny amount of veggies and very little meat. I then wrote up some basic guidelines for her on what she needed to change to achieve her goal. Of course, I also suggested that she do some exercise. I got a whole bunch of excuses, and for the next three months, she continued eating the exact same way she always had, and naturally, nothing changed. Yesterday she told me that she's been out and bought one of those diet shake packages that pharmacies sell. I raised my eyebrows. She looked a bit sheepish, and said that her friend had lost a lot of weight on this diet. I sighed, smiled and walked away. I'm completely over wasting my breath trying to convince folks that healthy eating is the way to go. If they want to waste their money on expensive and nasty-tasting shakes that are going to leave them hungry and constipated, and then regain the weight as fast as they lost it, that's their lookout. I know in the past I've sucummbed to a total food group elimination, ie carbs to lose weight quickly but mainly because I didn't have a voice of reason to talk me out of it or because everyone else was doing it. A colleague is currently doing a shake diet. He has gone from a very high carb diet to cutting them out completely. I'm just holding my tongue on this one too. You're not wasting your time, she heard and she'll be back when she's prepared to put in the effort it takes to make the change. We just have to hope that though they listen, one day they will hear and act. While I try to generally follow Atkins, I only use it as a guide and it has changed a lot lately. I still eat carbs but I get them from vegies! If I exercise that day then I allow myself more carbs than if I don't. I don't eat anything sugary though like cakes etc and suprisingly I don't even really miss them or crave the anymore. I just stick to whole natural foods and dairy - pretty simple really. It also cuts down a lot on your footprint with regards to rubbish that gets thrown out each week, I would throw out no more than 1 shopping bag of rubbish a week! She'll be back Kek, more than likely, numerous times and one of those times she'll be ready to listen. It interests me to watch this emergence of the 'shake diets' ever since Tony Fergusson started flogging his off. I wonder if you've seen the latest ad for Optislim. They're calling it the VLCD program. That is Very Low Calorie Diet. Apparently if you present it as the VLCD it has a ring of authority about it,and if you buy it at the chemist it must be good for you, right? Hubby wanted to go on it. I told him he was a fool and made him go on a proper well-balanced diet, you know the one that doesn't include beer or pizza, and surprise, surprise, he lost 7kg in 5 weeks. I would expect your friend is hoping she'll lose weight just by talking about it. Lord knows, I really wish I could do it that way too. That sounds like the discussions I have with my workmates nearly everyday. I need to have a tape recorder with potatoes are not evil, shake diets don't work, eat a balanced diet with loads of fresh veg and lean protein playing all day. Ya know what I hate even more? Wasting my time writing diets and programs for these people, who will then NEVER use them. I'm with you - I made a choice a while back, after experiencing too much of this - I now just smile, nod my head, and agree with them. And then listen to them whinge once they put all the weight they lose back on, plus some. I am so hearing ya sista! Heard it all before...and countless times I too have spent hours trying trying to convince people about what would probably work better with their food and exercise choices; but even though we (you and I and countless other fitness folks) walk the talk-and have the pics to prove it-so many of them just don't get it and never will.